Figure 1. Canaletto, Grand Canal: the Rialto Bridge from the North, 1725. Oil on canvas, 91.5 x 135.5 cm. Private Collection. The Rialto Bridge seen from the side of the Fondaco dei Tedeschi which is opposite the Palace of the Camerlenghi Magistrates and other Magistrates, with other buildings nearby which look on to the vegetable market where all kinds of vegetables and fruits are delivered to be distributed to the suppliers in the city. In the middle of the Canal is painted a Peotta Nobile with figures in it and four Gondoliers going at full speed and close to it a gondola having the livery of the Emperor’s Ambassador. Figure 2. Canaletto, Grand Canal: the Rialto Bridge from the North, 1725. Pen and brown ink with red and black chalk on paper, 14 x 20.2 cm. Oxford, The Ashmolean Museum. possible. 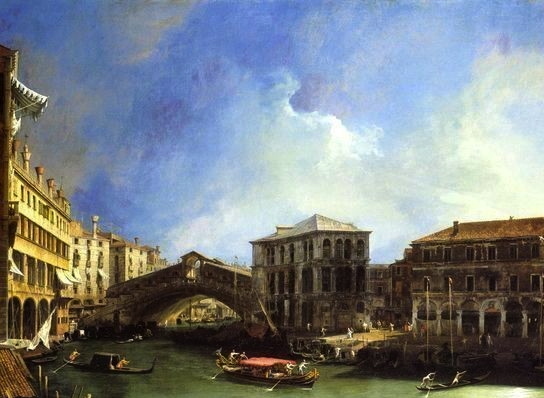 This means that the two buildings on the right-hand side of the Grand Canal had to have been studied separately before they were combined into this scene. 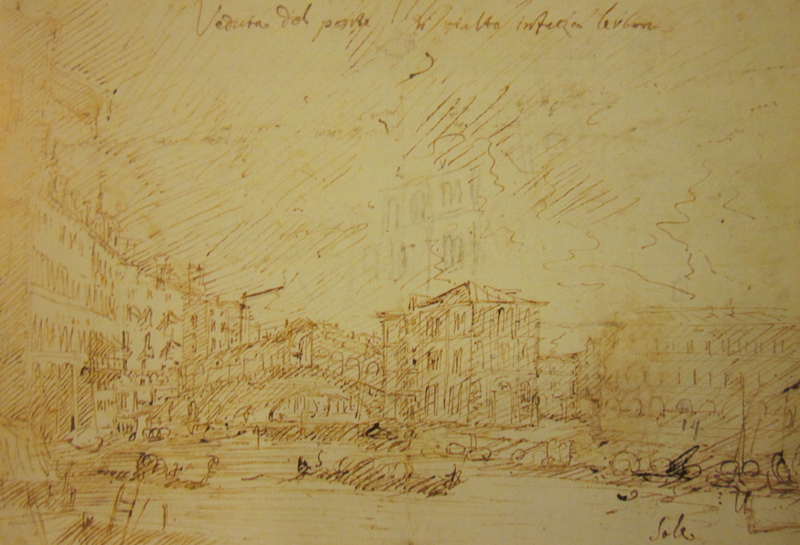 By looking at Canaletto’s preliminary sketch of the painting (fig. 2), one can clearly see how he constructed this imaginary view. Figure 3. Canaletto, Grand Canal: Looking North from near the Rialto Bridge, 1725. Oil on canvas, 91.3 x 135 cm. Private Collection. Figure 4. Canaletto, Grand Canal: looking North from near the Rialto Bridge, 1725. Pen and brown ink on paper, 17.5 x 28.5 cm. Private Collection. 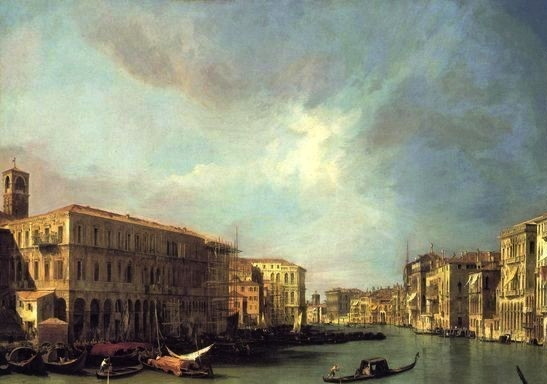 the gondolas are black; splashes of white are provided by bright white cloths; the canal is mainly greenish-gold and green-blue; and the cloudy skies are many tones of blue. Moreover, both paintings are similarly organized: the sky comprises about two-thirds of each painting, while the cluster of buildings and the Grand Canal make up the bottom third of the compositions. Figure 5. Canaletto, Venice: Campo S. Vidal and Santa Maria della Carita (“The Stonemason’s Yard”), 1727-1728. Oil on canvas, 124 x 163 cm. London, The National Gallery. hardly altered the scene at all. Here, the Campo San Vidal is the space into which the viewer is invited, with the Grand Canal in the middle ground. The church of Santa Maria della Carità sits on the far side of the Grand Canal. The picture is unlike anything previously done by Canaletto. The subject matter strays far away from what he depicted in the urban areas of Venice. Here, he chose to focus on a quiet corner of the city. Michael Levey noted that, “part of the difficulty of dating the picture is due to its uniquely high quality. It is perhaps the product of a moment of fusion between Canaletto’s early and mature styles, both of which seem present in it.” He has, however, elevated the viewpoint again by creating his balcony perspective, as seen in Grand Canal: Looking North from near the Rialto Bridge (fig. 3), which allows us to look down on the scene. Otherwise, he has stayed true to the actual topography of what he observes. Today, there have been several changes made to the scene, including the addition of the Accademia Bridge, alterations on the church façade, the destruction of the campanile, and the building of a pseudo-gothic palace at the left. Unfortunately, no preliminary drawings for this work are known, so scholars are unable to study whether or not he made any changes to the composition. 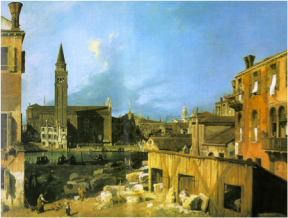 Nor were there any painted by any of Canaletto’s contemporaries. Tancred Borenius, “A Canaletto Curiosity,” The Burlington Magazine for Connoisseurs (September 1921): 109. David Bomford, Venice through Canaletto’s Eyes (New Haven: Yale University Press, 1998), 17. Tancred Borenius, “A Canaletto Curiosity,” The Burlington Magazine for Connoisseurs (September 1921): 111. William George Constable, “Canaletto and Guardi,” The Burlington Magazine for Connoisseurs (December 1921): 300. David Bomford, Venice through Canaletto’s Eyes (New Haven: Yale University Press, 1998), 18. Oliver Millar, “Venice. Canaletto,” The Burlington Magazine (October 1982): 653. William George Constable, Canaletto: Giovanni Antonio Canal, 1697-1768 (Oxford: Clarendon Press, 1962), 54. 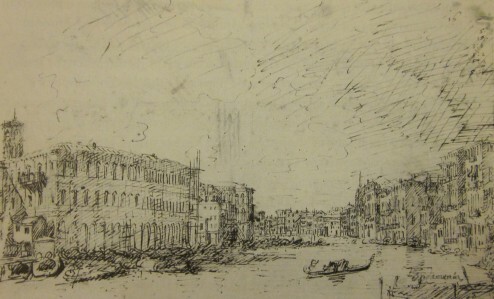 David Bomford, Venice through Canaletto’s Eyes (New Haven: Yale University Press, 1998), 44. Figure 1. Image scanned from: David Bomford, Venice through Canaletto’s Eyes (New Haven: Yale University Press, 1998), 15. Figure 2. Image scanned from: David Bomford, Venice through Canaletto’s Eyes (New Haven: Yale University Press, 1998), 15. Figure 3. Image scanned from: David Bomford, Venice through Canaletto’s Eyes (New Haven: Yale University Press, 1998), 16. Figure 4. Image scanned from: David Bomford, Venice through Canaletto’s Eyes (New Haven: Yale University Press, 1998), 17.